Perfect machine tools for precise and robust heavy-duty cutting, precise finish machining and effective 5 side machining of large, complex and heavy work pieces. Floor plates, rotary traversing and tilting tables, reversible clamps, automatic changing of spindle units or heavy tools via pick-up stations can be integrated. These options guarantee efficient machining of all work pieces. UnionChemnitz is the oldest existing machine tool manufacturer in Europe with more than 160 years of experience. 180 highly-skilled employees shape the technology of the future with their know-how and pioneering spirit. UnionChemnitz machines have a reputation of excellence around the world, based on innovation, flexibility, quality and performance. Thanks to these values, UnionChemnitz maintains its position as a market leader in the manufacture of horizontal boring and milling machines. Boring mills made by UnionChemnitz are suitable for machining workpieces up to 40 m (131 feet) long, up to 10 m (33 feet) high and up to 250 tons. 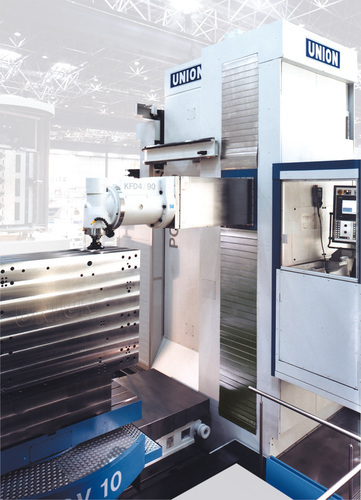 UnionChemnitz is the only German supplier to offer boring mills covering the complete range of 110 to 260 mm spindle diameter – with linear or fully hydrostatic guideways – as well as a wide range of travelling column mills. Thanks to a comprehensive range of equipment, the machines cover many applications.